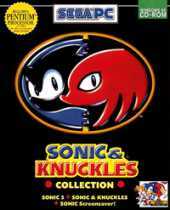 This contains three games ported from the Sega Genesis: Sonic the Hedgehog 3, Sonic & Knuckles, Sonic 3 & Knucles, and Blue Sphere (in options dialog as "Special Stage Mode") - a minigame based on the Chaos Emerald bonus levels with unlimited randomly generated unique levels. The ports have all of the music emulated in MIDI format. Some music (Carnival Night Zone, Ice Cap Zone, Launch Base Zone, Knuckles' theme, and the credits music) was replaced with original music. It also has a Sonic Screen Saver, artwork from the games, and the ENTIRE Japanese Sonic CD soundtrack in 11kHz WAV format.